This item is available in 112 cover options. Click to view options now! Class up the look of your contemporary home with this three-four person sectional sofa. Designed to reflect a smooth and tailored style, this piece features an urban loft feel with flat track arms and minimal show feet. 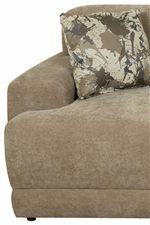 Tufted accents on the sides of the piece supply it with a unique charm while the thick padded cushions provide comfort and support. Available with the chaise on the left or right side, this piece will act as an urban element of elegance within your home. Includes 20" throw pillows. The The P Series Contemporary Sectional Sofa with Left Facing Chaise by England at Crowley Furniture & Mattress in the Kansas City Area: Liberty and Lee's Summit, MO & Overland Park, KS area. Product availability may vary. Contact us for the most current availability on this product. Padding & Ergonomics Back cushions are (attached) block foam with polyester fiber cap. Seat cushions are tight (non-reversible) block foam with ultra soft foam cap/wrap with coils. Give your room a contemporary make-over with the simple aesthetic of this upholstery collection. Designed to create a cool and casual living room environment, this sectional sofa and living room collection feature an assortment of straight-lined pieces for your casual seating space. The simple, geometric shapes that the collection contains help to make rooms look clean and organized. Items in this collection are complete with two button-tufted accents on the side of the frame and included toss pillows with the sofa and sectional. The The P Series collection is a great option if you are looking for Contemporary furniture in the Kansas City Area: Liberty and Lee's Summit, MO & Overland Park, KS area. Browse other items in the The P Series collection from Crowley Furniture & Mattress in the Kansas City Area: Liberty and Lee's Summit, MO & Overland Park, KS area.